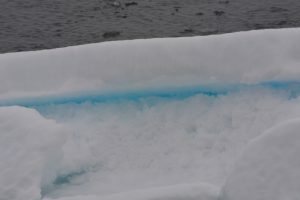 The sea ice shimmers with different shades of blue. Photo: Jutta Vernaleken. By now almost half of my stay on Polarstern is over. Polarstern left Bremerhaven at 9am on the 10th of July with 42 nautical crew and 57 scientists on board, their instruments, lab materials and supplies. A tv crew was there and spectators stood in Bremerhaven’s drizzle to wave as we were escorted by two tug boars and a pilot out into the Weser estuary. This is my first long cruise on a research vessel and I was very excited to have the opportunity to be on board. I was also slightly nervous. How will it be like living and working together in such close proximity? How will it be not to be able to just take a walk in the park, to be alone or exercise? Will I manage all the tasks I am set? And most important of all: will I get sea sick? This Satellite picture shows the ice floe the day before we recovered the mooring. 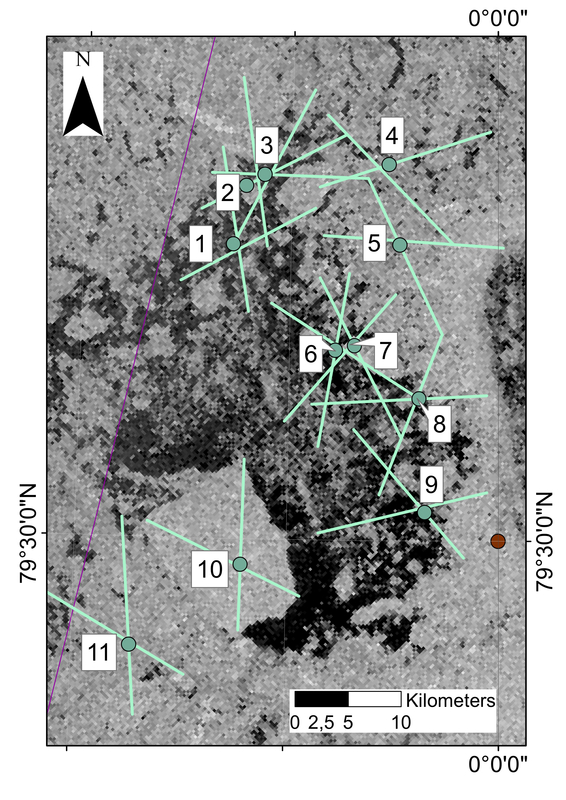 The track of the ice floe is marked in cyan dots and crosses. The floe drifted from point 1 to point 11 over the course of 11 days. The mooring location is marked with a red dot. Satellite picture from ESA’s Sentinel-1 mission, 20th July 2018. I am part of the CTD watch on board. The CTD measures temperature, salinity and pressure in the ocean. Further, there are bottles attached on a rosette around the instrument which are used to take water samples at different depths. To deploy the CTD the ship has to stop. Then the CTD is lowered over the side of the ship, in some cases right down to the sea floor. When the CTD is pulled back on board other groups are already waiting, ready to collect the water samples. Afterwards, the work in the labs can begin, analysing the collected data. Next to the watch duty with the CTD, everyone in our team has small extra duties. I am responsible for keeping an eye on the see ice in our study area. Before we set out, I ordered satellite pictures to be sent to Polarstern daily. On these satellite pictures I can see if there is sea ice near our planned stations, whether the sea ice forms a closed surface on the ocean or if there are only loose ice floes drifting around. This information is important to plan our route and also to know beforehand if certain jobs can be performed at a station. By now I have looked at satellite pictures of ice for almost two weeks but have never actually seen real sea ice. Here I should probably explain why my title is technically wrong. We can roughly distinguish two different types of ice drifting on the ocean: Icebergs and sea ice. Icebergs break off from glaciers that flow into the ocean, for example in Greenland or Antarctica, and are made of frozen fresh water. Sea ice grows from freezing salt water at the ocean surface and can break up into smaller ice floes. In general ice floes are much thinner than icebergs and it is a good thing that they are, because even an ice breaker like Polarstern can’t break up a large iceberg. And we do not want to end like the titanic! Last night I was jolted out of my sleep at 11pm and at first could not place what had woken me. Only later did I realize that our ship had sailed in among the shifting patches of sea ice drifting south in Fram Strait. All of a sudden, the waves which had rocked me to sleep during the last days were gone. 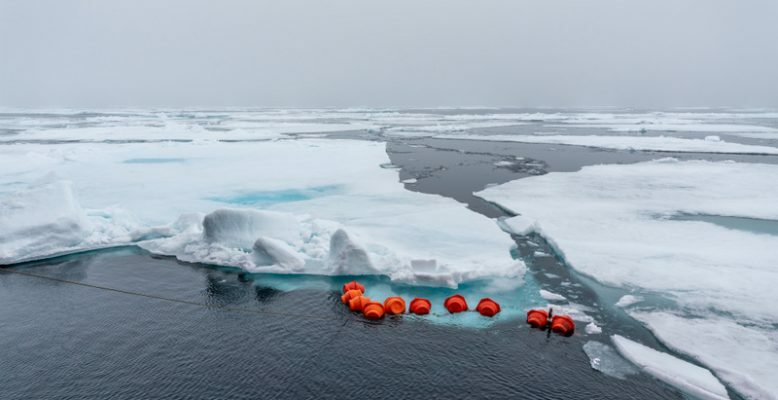 Instead of the regular pitching and rolling, Polarstern shudders and lurches every time she crushes an ice floe under her bow. These ice floes have kept me on my toes during the last few days. I am tracking particularly large floes on my satellite pictures to see where they are drifting. Should a large floe lie over one of our mooring locations we can not recover that mooring. And one of the ice floes was heading straight for our next site! The floe is approximately 10 Km wide and 15 Km long, definitely too big to allow mooring work. Should we go to a different station first? Wait until the foe has drifted past? 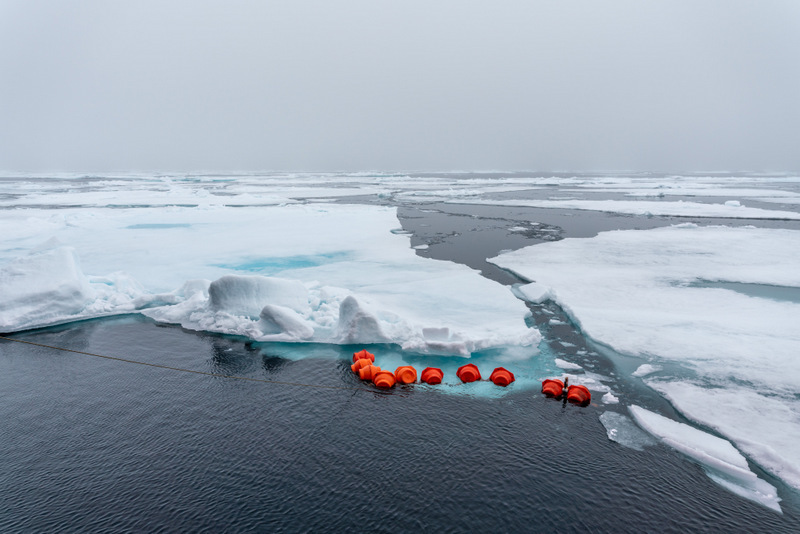 Hope, that the floe narrowly misses the mooring site so that we can work there after all? On the day the decision had to be made the floe was only 3 Km from the mooring location. So what should we do? I once more calculate the speed of the ice floe and tried to estimate it’s course. In the end we decide to go to the mooring location, hoping, that the ice floe will indeed have passed by when we arrive. To be on the safe side we allow for different scenarios. Should we not receive new satellite pictures before arriving at the station we can use the ice radar on board Polarstern to estimate the size of the ice floe once we are close to it. Polarstern can also drift with the ice floe to find out the drift direction and speed. One of the Officers on the bridge tells me how the radar system works and we settle that someone will wake me up as soon as we arrive at the station so that I can have a look at the ice situation from the bridge. Just when everything is settled the new satellite pictures arrive: the ice floe was faster than expected and is already 20 Km downstream from the mooring. We can recover our instruments and I can sleep in. Just after breakfast we start the recovery. Using the ice radar, the captain spots a patch of open water right over the mooring. The mooring is released and a couple of seconds later it drifts to the surface, coming up exactly where the captain predicted! I have already marked the next ice floes that lie in our path on my maps so that I can track them more easily and I hope that our luck holds. Now that the mooring has been safely recovered, I finally have the time to enjoy the beauty of the sea ice. I am fascinated be the myriad of colours and the fantastic shapes. Alexander Humboldt took a cyanometer on his travels to measure the “blueness” of the sky. 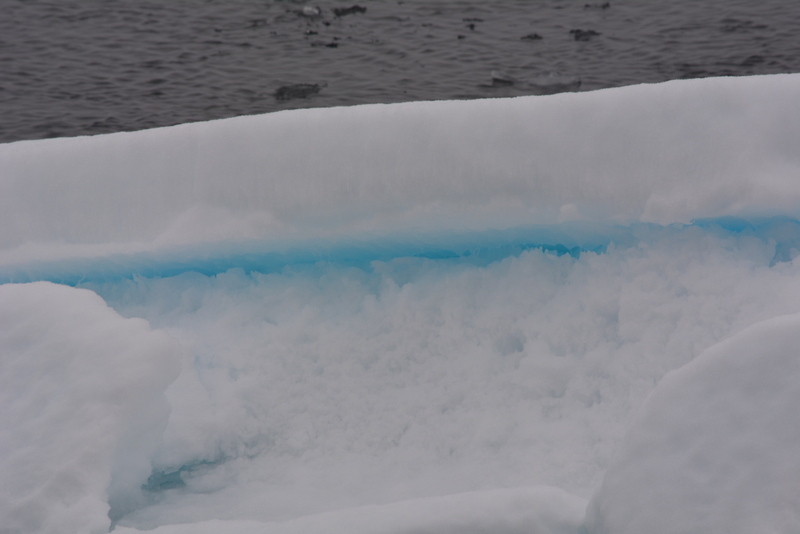 We don’t measure the different shades of blue of the sea ice, it is beautiful regardless. Finally, I want to answer a question that I got asked a lot: Do you sleep in hammocks? No, there are proper beds on Polarstern. Everything else is very comfortable too. None of my fears have come about. I miss going for long walks, but Polarstern has a nice gym. My colleagues are all really nice and everyone looks out for the others. And: I do not suffer from sea sickness. At least not with the calm seas we are experiencing. If that hold up I will certainly miss the gentle rocking of the ship once I am back on land. And a hammock would actually be quite enjoyable!